This film is written and directed by Dan Fogleman, making his directorial debut, and partially based on a true event. It is a decent movie to watch if you are a fan of Pacino, who can still carry a film, even if it may not be as monumental as his work of yesteryear. Danny Collins was once a musician on top of the world, a Neil Diamond type. Now old and tired, he is fed up with the routine of touring and playing his past hits. He hasn’t made any new material in years. However, his manager and best friend (Christopher Plummer) gives him an astonishing birthday gift. It is a letter written to Collins from the early 70’s, penned by John Lennon. The letter was hidden from him, and made its way around the collectors market, until now. Wondering what his life would have been like had he met Lennon (the letter proposes this), he is now inspired to create new work, and fix his crumby life. Collins heads to New Jersey, where he stays at a Hilton hotel. Immediately, he tries to hit it off with the similar aged manager, played by Annette Bening. This relationship forms one of the movie’s running gags. The main reason Collins is in Jersey, though, is to surprise his estranged son. 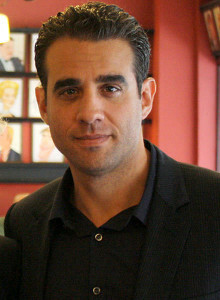 Played by Bobby Cannavale, Collins has never met his child. Of course, he is not immediately welcomed. The rest of the film revolves around Collins doing whatever he can to amend this broken relationship. As the film continues along, Collins eventually begins to soften up his son. When Collins sets up a gig at a local bar, he invites his son and his family to come see him. He is to perform the new music he has been working on. When he gets on stage, the crowd has no interest in hearing this new tune. They simply want “Hey Baby Doll,” his signature song. He crumbles, and backstage afterwards, slips back into his destructive ways of drug use. A heartbreaking scene follows, as his granddaughter and son walk in on him. All he has worked for so far quickly dissipates. The granddaughter is played by Giselle Eisenberg, and she may be the film’s biggest treat. Although she is only a child, she steals all her scenes. She is a natural and simply adorable in front of the camera. Ultimately, Collins decides the best option is to head back on tour. But not before he accompanies his son one last time at the hospital. The script squeezes in a disease storyline to add to the strain and difficulties for these characters. Pacino does a fine job in this role, perfectly suited for him in his elder years. Plummer does a great job when he’s around, acting as Danny’s advisor and uplifter. Cannavale holds his own as the abandoned son, while Jennifer Garner (who stars in Dallas Buyers Club) supports him as his wife. The script is decent, and the direction is solid. Overall, it is a film you can watch once if you enjoy these actors, but you probably won’t revisit it.